The red fox (Vulpes vulpes) is the largest of the true foxes and the most abundant member of the Carnivora, being present across the entire Northern Hemisphere from the Arctic Circle to North Africa, Central America and Asia. Its range has increased alongside human expansion, having been introduced to Australia, where it is considered harmful to native mammals and bird populations. Because of these factors, it is listed as Least Concern by the IUCN. Due to its presence in Australia, it is included among the list of the "world's 100 worst invasive species". The red fox has an elongated body and relatively short limbs. The tail, which is longer than half the body length (70% of head and body length), is fluffy and reaches the ground when in a standing position. Their pupils are oval and vertically oriented. Nictitating membranes are present, but move only when the eyes are closed. The forepaws have five digits, while the hind feet have only four and lack dewclaws. They are very agile, being capable of jumping over 2-metre (6 ft 7 in) high fences, and swim well. Vixens normally have four pairs of teats, though vixens with seven, nine or ten teats are not uncommon. 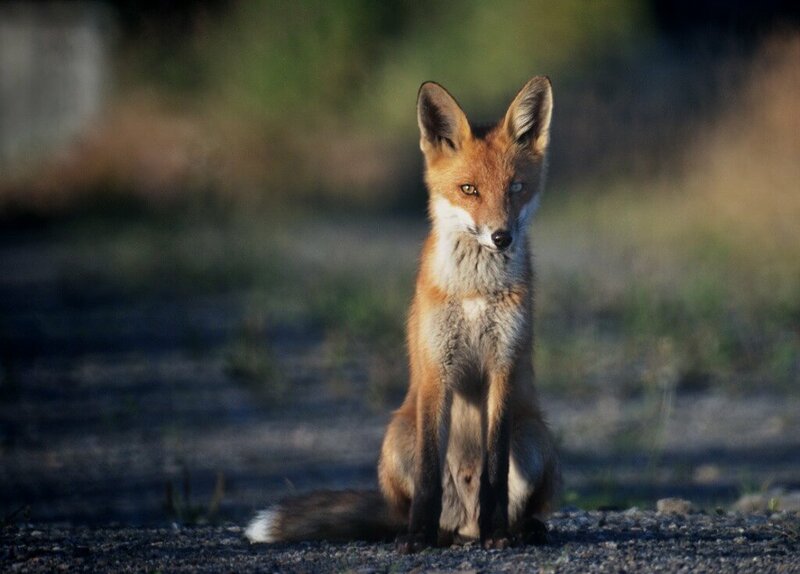 Red foxes are the most important rabies vector in Europe. In London, arthritis is not uncommon in foxes, being particularly frequent in the spine. Foxes may be infected with leptospirosis and tularemia, though they are not overly susceptible to the latter. They may also fall ill from listeriosis and spirochetosis, as well as acting as vectors in spreading erysipelas, brucellosis and tick-born encephalitis. The urban fox has become quite a problem for some people. Disrupting rubbish bins, stealing chickens and wrecking gardens, the urban fox can become a nuisance. Most complaints about urban foxes made to local authorities occur during the breeding season in late January/early February or from late April to August, when the new cubs are developing. In the UK, hunting foxes in urban areas is banned, and shooting them in an urban environment is not suitable. One alternative to hunting urban foxes has been to trap them, which appears to be a more viable method. However, killing foxes has little effect on the population in an urban area; those that are killed are very soon replaced, either by new cubs during the breeding season or by other foxes moving into the territory of those that were killed. A more effective method of fox control is to deter them from the specific areas they inhabit. Deterrents such as creosote, diesel oil, or ammonia can be used. Cleaning up and blocking access to den locations can also discourage a fox's return.